Hi everyone. Tomorrow morning I am off to Morocco. I am taking the TGV to Paris and then from Paris I am flying to Ouarzazate via Casablanca. I will arrive there late evening and stay in Ouarzazate overnight. The following day the tour agent will show me the type of terrain that will be covered in the MDS. We will stop overnight somewhere along the way, en route to Merzouga. 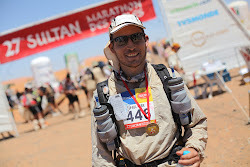 After that I will be based 2 weeks in Merzouga by myself, training on the Erg Chebbi sand dunes. I just googled the temperature in Merzouga and apparently today it is 20C. It should be getting hotter as the week goes on. For my own benefit I hope it gets hotter while I am there than it does during the MDS itself. I am currently packing everything that I will need for the race and for the 2 weeks of training beforehand. I really hope I don't forget anything, as some things would be really difficult to get once I am out there. Probably the best idea is that I lay it all out on the bed and then go through it all again later and see if I can remember anything else I may need. I am very excited that it is now so close, having been preparing for this for over a year now in one way or another. In fact I have been preparing for it ever since I created this blog. There is no going back now - Morocco here I come.